Lynn Angell is recognized for 25 years as a board of education member. 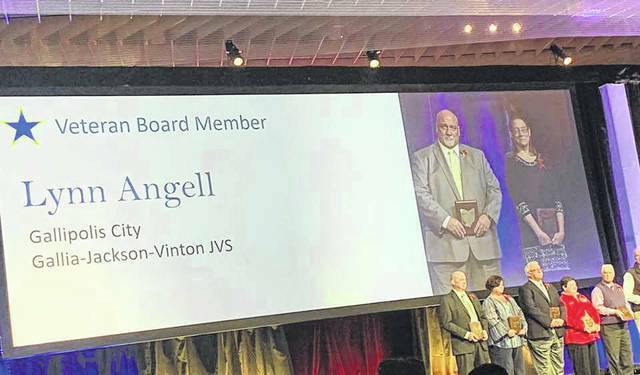 COLUMBUS — Lynn Angell, a board member who has served the Gallia-Jackson-Vinton Joint Vocational School District representing the Gallipolis City School District, received Ohio School Boards Associations Veteran Board Member Award at the association’s 63rd annual Capital Conference and Trade Show, Sunday, at the Greater Columbus Convention Center. The Veteran Board Member Award is given to school board members in recognition of 25 years of service. Of the nearly 3,500 board members in Ohio, only 28 will receive the honor in 2018. In its 63rd year, the Ohio School Boards Association says its mission is to lead the way to educational excellence by serving Ohio’s public school board members and the diverse districts they represent through superior service, unwavering advocacy and creative solutions.